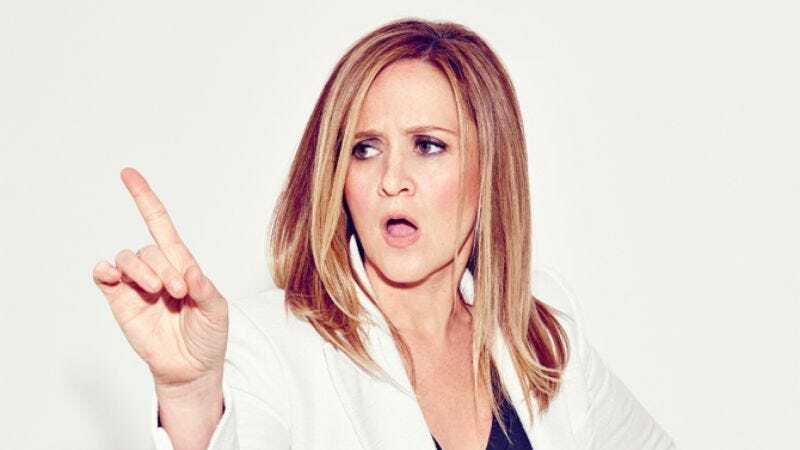 Although the premiere is still days away, TBS’ Full Frontal With Samantha Bee is already taking over television—at least, the channels that fall under the Turner networks banner. According to a press release from the networks, Full Frontal will have its premiere simulcast on TBS, TNT, Adult Swim, TruTV, and HLN on February 8 at 10:30 p.m. ET. So prepare for the preempting, Dr. Drew. Despite slightly inconveniencing viewers looking for a rerun of American Dad or Law & Order, Turner wants to give the new weekly series, which will be the only woman-led late-night show, the kind of warm welcome that Viacom offered Trevor Noah when he took over as Daily Show host last fall. Bee will command that five-channel audience for the premiere of her new show, which will skip the celebrity sit-downs to focus on “in-depth stories that are more or less overlooked by traditional media outlets.” She’ll also eschew the traditional desk-and-couch setup in favor of standing in front of a bunch of TV screens, the better to “womanspread” across the late-night landscape.